LEGO Batman: The Movie – DC Super Heroes Unite may be only 71 minutes long, but it feels like a combination of Traveller’s Tales video game and a cartoon spin-off and can’t figure out which medium it wants to be. Granted, this is a movie in name only, crafted by Traveller’s Tales (original producer of ALL the LEGO videogames). 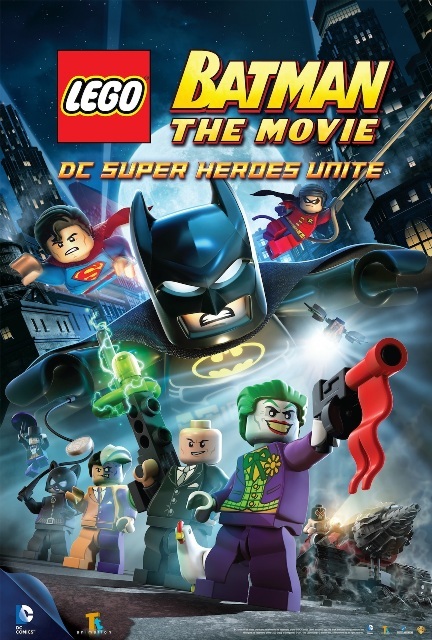 In fact, this almost feels like a sequel to their best-selling game LEGO Batman 2: DC Super Heroes (which was the very first LEGO game to feature voice actors). Starting with Danny Elfman’s iconic Batman score, this movie feels like it belongs within Batman: The Animated Series’ universe, but quickly strays as soon as a character speaks. None of the original voice actors are featured and this is a huge weakness. LEGO Batman and Superman have teamed up to tackle Lex Luthor and The Joker’s devious plans taking place on Election Day. Harley Quinn, The Riddler, Catwoman and The Penguin eventually crash the party, which only amount to brief cameos. Wonder Woman, Green Lantern, The Flash and Cyborg briefly hold them off for the climactic conclusion. Sadly, the title is misleading. There’s not a lot of interaction for other superheroes and supervillains, turning them into minor background characters. There wasn’t a lot of super heroes uniting in this movie. The movie’s animation is great. Traveller’s Tales’ signature goofy jokes are also featured, originally giving the video game its charm, but sometimes feeling a little out of place in the movie. Environmental objects are interchangeable in the trademark LEGO style and there’s even a few brief video game references. The biggest drawback is the voice talent. The animated characters sound like impersonators, trying way too hard to mimic roles popularized by other actors. The Riddler sounds like he’s impersonating Jim Carey and Superman’s voice is just unbearable. Clancy Brown’s Lex Luthor does outshine the rest, which is understandable, since he’s continuing his role from past animated Batman series. Oddly enough, Robin has all the one-liners. In the Extras menu, Animator Garrett Barati discusses animating with actual LEGO toys in Building Batman. Winning animated shorts are also included, as well as episodes of Batman: The Brave and the Bold and Teen Titans. This disc includes plenty of entertainment value for fans of all ages. In fact, the Extras, alone, are worth the price of admission, if you can tolerate the voice actors. Strength: Great animation and even greater extras! WTF Moment: The Robin-Catwoman chase was reminiscent of Tron’s lightcycle duels.